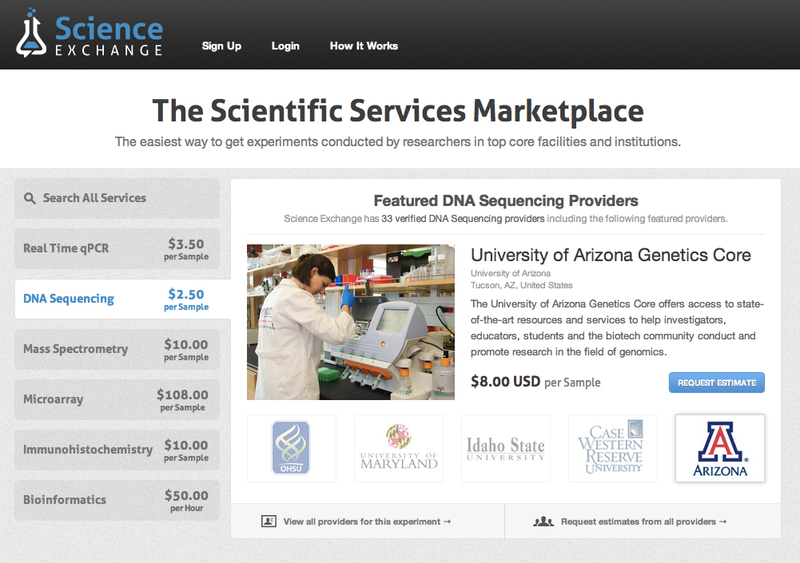 At Science Exchange, we’re always looking to improve the user experience, and help our providers promote their services. That’s why we’re excited to launch our redesigned homepage, with spotlighted facilities and integrated search. The new homepage spotlights facilities offering our most popular experiment types, including: Real Time qPCR, DNA Sequencing, Mass Spectrometry, Microarray, IHC, and Bioinformatics. You’ll find a slideshow of our top providers, with the relevant service descriptions and pricing information. When you search from the homepage, you now get immediate information on a particular service. Results return the number of providers and the relevant price for that service, right from the search bar. We have an updated About Page as well, with an overview of our company, mission, and team. You can visit to learn more about our awesome engineering and support team, our prestigious investors, and our network of advocates.